Spiders are considerably different to insects as they consist of 8 legs instead of 6 and they have two body segments instead of 3, as the head and thorax are combined into one which contains the eyes, mouthparts and legs. 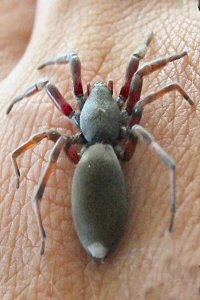 The White Tailed Spider is a dark grey, cylindrical spider. The legs have a dull reddish tinge, which are banded in a dark grey/brown colour. They have a distinctive white tip on their abdomen. The females are up to 18mm long and the males 12mm. White Tailed Spiders are vagrant hunters that live beneath bark, rocks and in leaf litter and logs, in bushland and gardens and they are often seen in houses. They are rumoured to be attracted to linen, sometimes brought in when bringing in the washing. They are most active at night when they wander about hunting for other spiders, their preferred food. During summer and autumn White Tailed Spiders are often seen in and around houses where they find both sheltered nooks and crannies and plenty of their favoured black house spiders and daddy long legs. 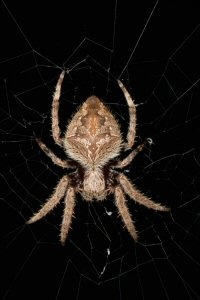 As one of a number of spiders that prefer inhabited areas, and it often builds its web in places like sheds or outhouses, bins, drains, beneath kids toys and outdoor furniture. Their webs are easily spotted, they are very messy and sticky and collect leaves and other rubbish blown into them by the wind. 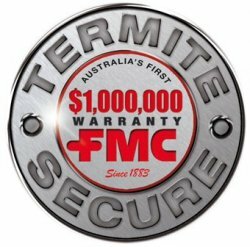 Their webs are usually below waist height and when cleaned should first be treated otherwise a venomous bite may be incurred .However, be aware of Redback spiders inhabiting roof voids, as they sometimes get transferred up there with roof trusses or air conditioning ducts. Bites are always from females as the male is much smaller and has jaws that are unable to penetrate the skin. The venom is highly toxic to humans but effective anti-venom is widely available. Redback spiders are shiny black in colour and have a distinctive red mark on its abdomen. 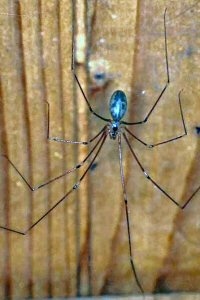 The female length is 10-14mm and the male 2-3mm. These are large fierce looking spiders, sometimes being 100-120mm wide, including body and legs. 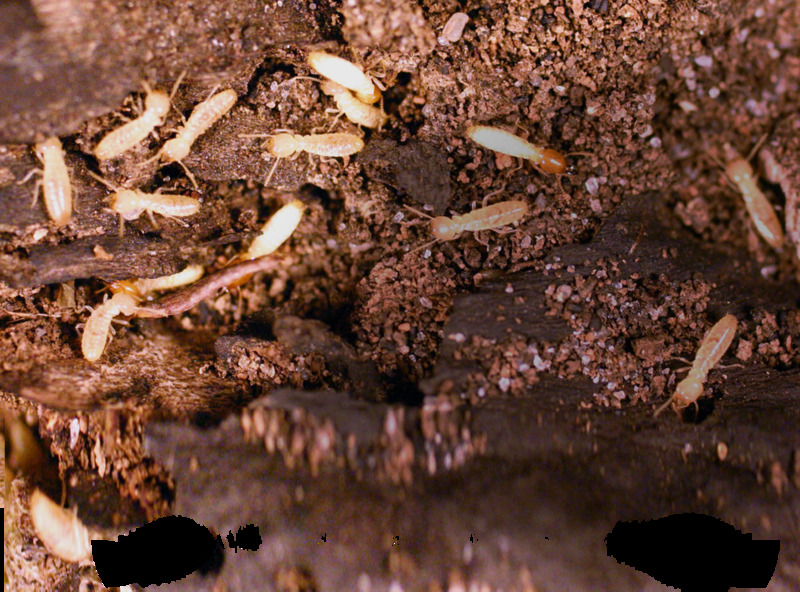 They are brown in colour and live under bark of trees and in roof voids of houses. They can invade homes much to the horror of spider haters because of their size and hairy appearance. Bites occur rarely and no known cases of fatalities exist. Some species are known to inflict a painful bite that may result in local discolouration and swelling, dizziness, vomiting, lethargy, irregular pulse, persistent nausea, sweating and a welt at the bite site. In young children the effects can be more exaggerated. The possibility of bacterial infection should be considered when treating any bite. Insufficient information exists on the toxicity of these spiders to state whether they are entirely harmless. They should be considered as useful because it feeds on other insects. 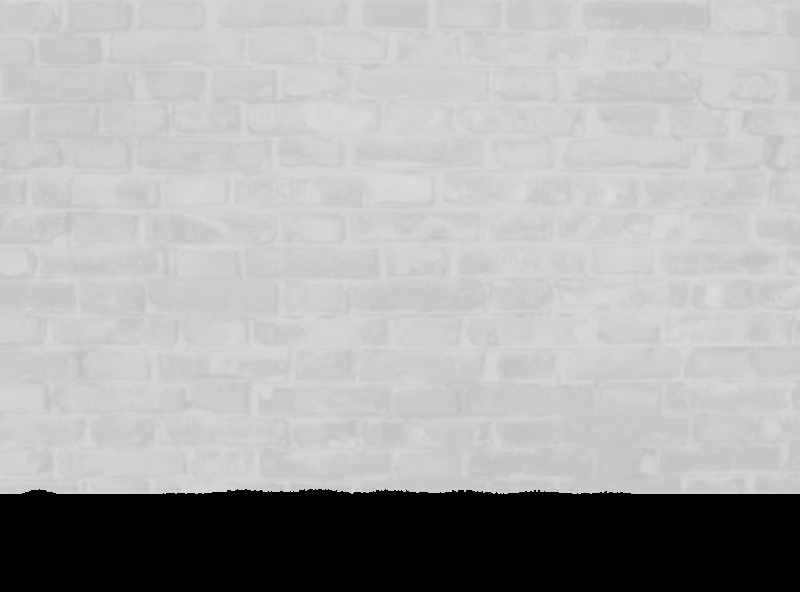 Commonly found in the corners of windows, doors eaves, under guttering and on brick walls. Webs can be unsightly on structures. Can bite – however they are rare and usually occur when people attempt to move the webs without taking adequate precautions. The bite can cause severe pain, numbness, headache, giddiness, nausea, vomiting, sweating and muscular pain. Legs are reddish brown and may span up to 25mm. Has same overall body shape as the Redback. Spider but does not inflict a dangerous bite. Web may include a curled leaf as a retreat for the spider. In webs without a retreat, the spider sits among the tangle and when disturbed, drops and lies curled up and still until the apparent danger has passed. 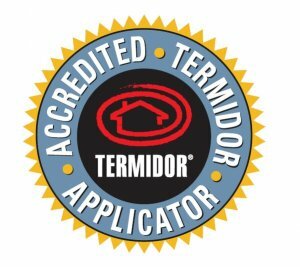 Builds untidy, tangled webs against walls, under eaves, around garage doors and among leaves on trees and shrubs. Webs can be unsightly on structures. Can bite – but not considered dangerous. Recorded symptoms of bite include mild nausea, headache and the formation of an itchy red welt at the bite site. 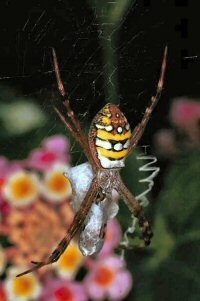 Most spiders are nocturnal and only appear during the day if they have been disturbed in some way. Different species share different characteristics, habitat and prey techniques. Those which depend solely on webbing to snare their prey seldom move very far and mostly hide in a crevice, curled leaves or camouflaged as twigs. Hunting spiders are a lot less dependent on webs and mostly travel for food. Males seek out the females at mating time and drop their sperm on the ground, bark or in webs specially made for this purpose. The male picks up his sperm with his long palps alongside his jaws (specifically used for this purpose) and places it into the female spiders genitalia. After mating the male is usually caught and consumed by the female. The venom is not necessarily poisoness to warm - blooded mammals but some are able to cause death by injecting an extremely toxic substance into the bloodstream of warm blooded animals. 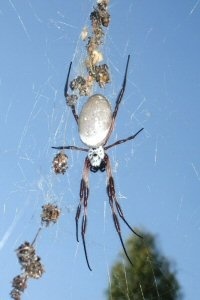 Most spider bites result in no more than localised swelling or irritation. Most spiders form their nests on the exterior of structures by spinning webs. Treatment of external surfaces of buildings to cracks and small openings, rough surfaces by application of a liquid spray to harbourage areas will provide a respite for 3 months or so. In areas where there are numerous trees. Two treatments should be considered during the summer months.